GOSHEN, Ind. – Jim Brenneman believes that the world needs Goshen College. Now, he is preparing to lead the institution in sharing its mission and core values in the local community and region, in the church and beyond. The Goshen College Board of Directors announced finalization of its appointment of educator, biblical theologian and church leader James E. Brenneman to serve as the college’s 16th president, beginning July 1, 2006, for a four-year term of leadership of the 111-year-old institution. With Goshen College’s relationship to Mennonite Church USA through Mennonite Education Agency (MEA), the MEA Board of Directors affirmed the appointment on Nov. 28. Brenneman, a 1977 Goshen College graduate who lives with his family in South Pasadena, Calif., was introduced to the campus and community in a chapel service Nov. 18 as a final step in a leadership discernment process. Rick Stiffney, vice chair of the Goshen College Board of Directors who led the Presidential Search Committee – a group of college alumni, church and community members and faculty representatives named a year ago – officially announced that Brenneman was the Board’s candidate of choice for the position vacated in September 2004 by Shirley H. Showalter. During his Nov. 18 campus visit, Brenneman spoke personably and passionately to a large crowd in the Church-Chapel about the unique character of the college and its Christ-centered core values. Brenneman will enter a five-month period of preparation beginning Feb. 1, 2006; activities for this time will be discerned by Brenneman and the Goshen College Board of Directors. He will officially take office July 1, 2006. 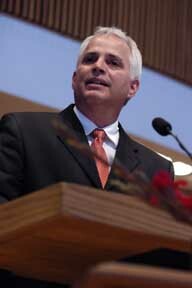 Ordained in 1986, Brenneman is the founding and lead pastor of Pasadena (Calif.) Mennonite Church. He joined the Pastoral Leadership Commission of the Pacific Southwest Mennonite Conference in 1990 and served on the Council on Faith, Life and Strategy of the Mennonite Church. He was president of the Center for Anabaptist Leadership and School of Urban Ministry in Los Angeles, Calif., from 1991 to 2002 and is again serving in that role for the organization. Brenneman’s teaching and scholarship has led him to posts on the faculty in Old Testament studies at Episcopal Theological School and as an adjunct professor at both Fuller Theological Seminary and Claremont School of Theology. Brenneman has said that his Goshen College experience was vital in shaping his faith and vocational direction. After graduating from Goshen with an interdisciplinary degree combining studies in Bible, biology and natural science and spending a semester abroad in Honduras, he attended Associated Mennonite Biblical Seminary before finishing his master of divinity degree at Fuller Theological Seminary. At Claremont Graduate University he earned a master of arts degree in religious studies and a doctorate, focusing on Hebrew Bible and Old Testament studies. The author of “On Jordan’s Stormy Banks: Lessons from the Book of Deuteronomy” (Herald Press, 2004) and “Canons in Conflict; Negotiating Texts in True and False Prophesy” (Oxford University Press, 1997), Brenneman has written book chapters and published numerous articles on theological and church-related themes. He is a frequent speaker and presenter at scholarly and church-related events. Brenneman had been named to the Presidential Search Committee, but withdrew after he was asked by the committee to allow his name to stand as a candidate; his departure from the committee could not be made public without jeopardizing the confidentiality of the search process in its early stages. “This was done with utmost integrity and discretion,” said Stiffney. Brenneman will move to Goshen with his wife, Dr. Terri J. Plank Brenneman, a clinical psychologist in private practice and an adjunct faculty member at two seminaries in pastoral care and theological counseling, and their son, Quinn, age 9. With her husband’s appointment, Terri Brenneman will leave her role as an MEA Board member and chair of the board’s Committee on Pastoral and Theological Education. She has also been active at Pasadena Mennonite as a congregational worship leader and music team member, and was formerly on the Mennonite Church General Board. As the 16th president to lead Goshen College in its long history, Brenneman joins a list of recent leaders that includes: Shirley H. Showalter, 1997-2004; Henry D. Weaver (interim president), July-December, 1996; Victor S. Stoltzfus, 1984-1995; J. Lawrence Burkholder, 1971-1984; and Paul E. Mininger, 1954-1970. In confirming Brenneman’s appointment, Miller said that the Goshen College Board of Directors also “extends its gratitude to [Interim President] John D. Yordy and a gifted and committed senior leadership team for excellent leadership of the institution during the presidential search period.” Yordy, who joined Goshen College’s chemistry faculty in 1977 and was appointed as provost during the Showalter administration, has been acting as interim president of the institution since October 2004 and will continue in that role until Brenneman takes office. EDITORS: For information or requests, please contact Rachel Lapp, director of public relations, at (574) 535-7571 or racheljl@goshen.edu.